Having picked up mere three points from first six games, Georgia haven’t got a lot to play for at the moment, although they will be looking to show some improvement when they play host to Republic of Ireland. The Irish, on the other hand, lead the chase in Group D together with Serbia and they arrive in Tbilisi high on confidence. With that in mind, it is important to note that Betfair has enhanced the price on away win from 7/10 to 25/1. 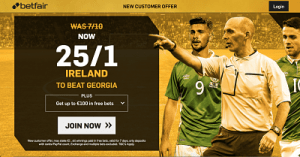 You need to sign up through this link, entering promo code ZFBDDU to qualify, and place a max £1 bet on the Republic of Ireland to beat Georgia at the enhanced price. All winnings are paid as free bets.